India recently launched what is arguably one of the largest food programs in the world. India’s government has launched a program to provide subsidized food to two-thirds of the population. However, critics believe the plan undermines the country’s small farmers and is a political move to win votes. It is arguably one the largest food aid programs in the world. India’s ruling party, the Indian National Congress called it a “game changer in terms of poverty eradication.” The National Food Security Bill approved by the Indian government on Wednesday, July 3, is the latest attempt to tackle the problem of endemic hunger in a country where nearly half of its children under the age of five are chronically malnourished, according to the government’s own estimates. Despite the remarkable growth rates of the past two decades, India ranked 65 out of 79 nations on last year’s Global Hunger Index issued by the International Food Policy Research Institute. Furthermore, the UN’s Food and Agriculture Organization reported that an estimated 217 million Indians were undernourished in 2012. The bill, which was passed by ordinance and still requires ratification by both houses of parliament, is set to provide subsidized food to nearly 67 percent of India’s population. There are already many food guarantee schemes for the poorest of the poor. However, the new bill is expected to vastly increase the target group. 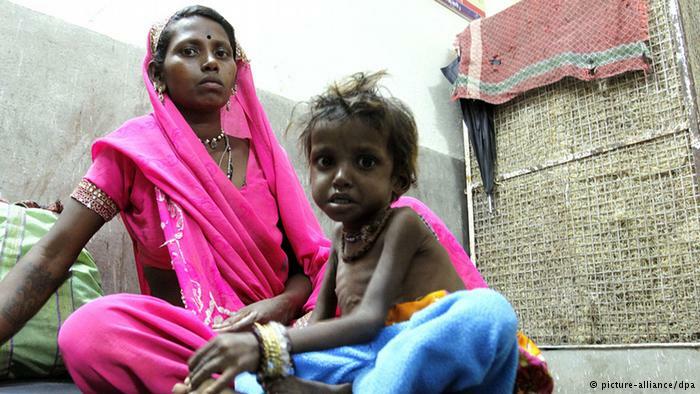 According to the government is almost every second child in India chronically malnourished. About 75 percent of the rural population and 50 percent of the urban population is supposed to benefit from the measure. According to the bill, around 800 million people will thus have access to subsidized food, whereby the amount of subsidies received would vary from household to household. So-called “priority households” would receive the maximum monthly entitlement of one kilo of rice at three rupees (five US cents), wheat at two rupees and millet at one rupee. 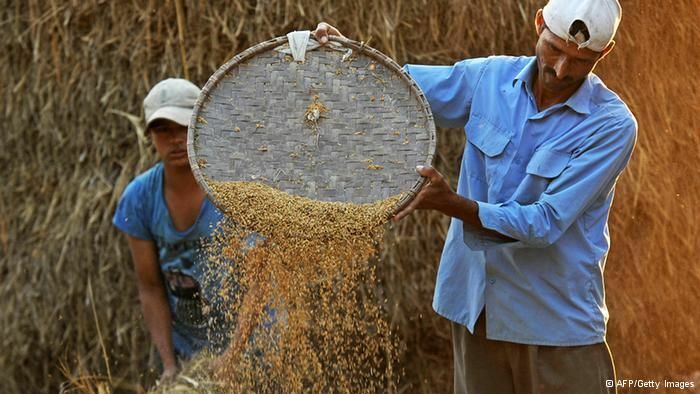 The bill already has the backing of some prominent citizens such as Nobel Prize-winning economist Armatya Sen. “The pushing through of the food security bill right now is a very important step to take,” Sen told German public broadcaster ARD. The expert from the Navdanya Research Foundation for Science Technology & Ecology told DW she believes that ensuring the production of safe, healthy and nutritious food should be the government’s top food security priority. But “on this count the act totally fails,” she says. 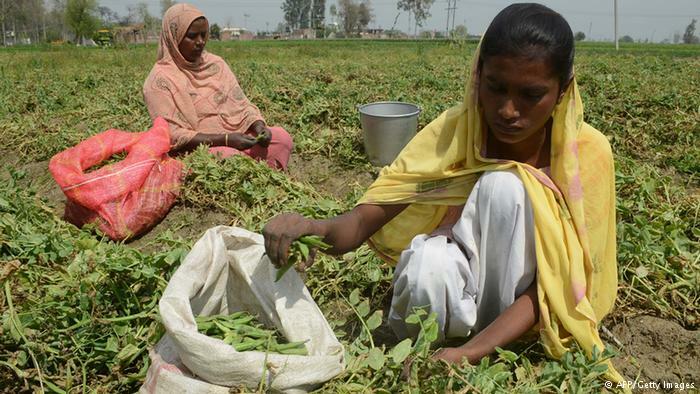 Indian workers sort peas after harvesting on the outskirts of Amritsar on March 20, 2013. As far as ecological and social foundations of food production are concerned, Shiva decried the measure “as an anti-food security act.” In her opinion, the new measures undermine the livelihoods of millions of small Indian farmers, thus threatening the country’s food sovereignty. Christian Wagner, India expert at the German Institute for International and Security Affairs shares a similar view on the program. “I don’t believe the program will help alleviate India’s endemic malnutrition in the long run,” Wagner told DW. On the contrary, he added, the scheme would probably turn into a “bureaucratic monster” and fail to tackle the more pressing the issues of supporting India’s agricultural sector. The cost and the implementation of the program have also drawn heavy criticism. Estimates suggest the bill could cost the Indian state $22.3 billion per year. Some experts believe this could exacerbate fiscal problems at a time when economic growth is slowing. Latest GDP figures show that the Indian economy expanded by five percent last fiscal year – the slowest pace in a decade, adding to pressure on the government to speed up economic reforms. India already has programs in place to subsidize goods ranging from kerosene to cooking gas, fertilizers and wheat to people living below the poverty line. But they have a reputation for being inefficient and undermined by corruption. According to a study by India’s Planning Commission, only about 42 percent of the subsidized food grains released from the Central Pool reach the target group. The landmark welfare scheme was pushed by the head of the Congress Party, Sonia Gandhi, who had insisted on honoring a 2009 election pledge despite concerns about the impact on government finances and food prices. Opposition parties, however, have slammed the minority government for sidestepping parliament and resorting to an executive order to implement the program. They view it as a political move by the ruling party to win a third term. “There are definitely elements of populism involved. Politicians often act with ulterior motives and the ruling coalition will definitely use it as a talking point in the general elections due by May 2014,” says Baruah. The plan was pushed by the head of the INC, Sonia Gandhi. Critics of the bill also emphasize that there has not been enough discussion of the program’s effect on prices and on farmers. Furthermore, the bill leaves out the aspect of where the extra goods are to be stored. In the state of Punjab alone, for instance, tons of grain rot every year due to the lack of storage facilities. India expert Wagner believes that although the program may benefit some, it still runs the risk of being ineffective because of what he calls “the three Cs:” high costs, lack of cooperation between central and local governments was well as the rampant corruption which already overshadows previous aid programs. 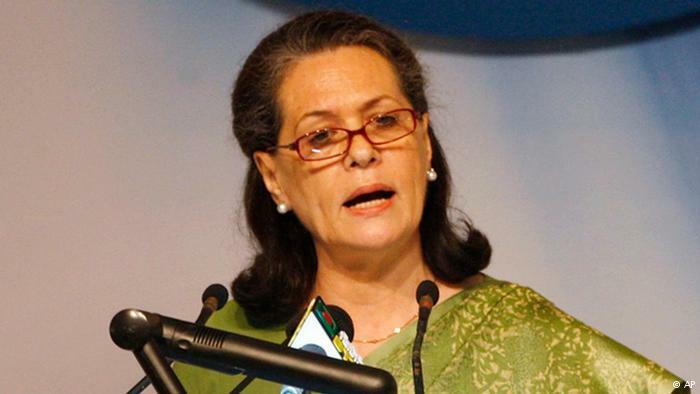 This entry was posted in English and tagged India launches vast food aid program, Sonia Gandhi by kiumars. Bookmark the permalink.